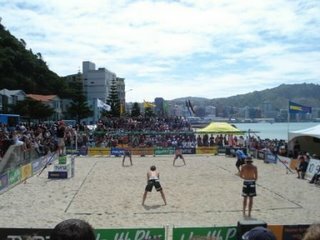 When we were in Paraparaumu we got the local paper and discovered that there was an international beach volley ball competition on in Oriental Bay, a suburb of Wellington City. It’s pretty typical that you discover these things after you have left for some where else. 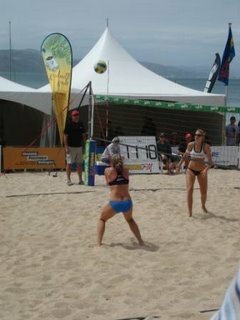 As the weather wasn’t great on the Sunday in Paraparaumu, or the Saturday or Friday for that matter we decided to take an earlier train back to Welly and go and experience beach volley ball for the first time. The women’s final between the Kiwi’s and the USA had started by the time we had arrived. So we couldn’t get a good view but we managed to take some photos through the crowd. The men’s volley ball final was after the ladies. There was a short break in between where the majority of the male spectators left! So we managed to get seats in the stands themselves. 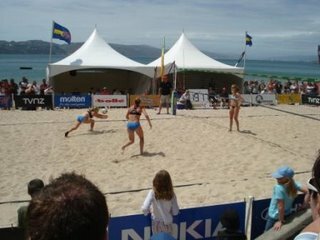 The Kiwi’s were again in the final this time taking on Estonia ranked a respectable ninth in the world. Normally you hear the word non partisan in relation to crowds or in particular the commentators. Not in NZ, we could not believe the commentator’s bias towards their fellow Kiwi’s, asking the crowd to cheer them on when the going got tough. 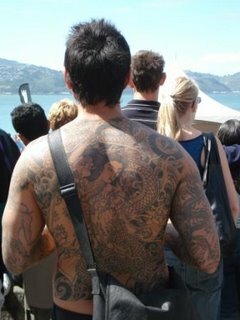 Here are a few pics of the men and a guy with an interesting tattoo in the crowd. The USA won the ladies’ final and the Kiwi’s, much to the delight of the home crowd and the commentator’s won the men’s. Needless to say Beach Volley Ball was the overall winner on the day. Cheesy or wha!